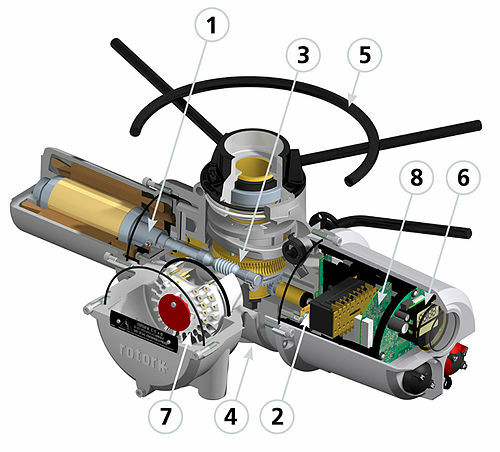 Actuators convert the electronic signals into mechanical force or mechanical force to mechanical or other physical variables to deliver desired quantities. It is a fully wrong idea that floats around that an Actuator always need to have an electrical or electronic component along with some kind of sensor. In the control and regulation by an actuator, the signal-transducer-based counterpart to sensors form a loop with actuator in a controlled way. Putting signals from a control can convert to mechanical work an example is the opening and closing a valve of a motor to throw a certain amount of liquid. In robotics , the term Actuator often is used synonymously with effector actuator. Effectors serve the robot, for example, for gripping and manipulating objects and thus produce an effect. In medicine and psychology, the term effector is used to denote the execution of a function of a physiological action (such as muscles or glands ) controlled by the neurons. In some areas of mechatronics , actuator such as stroke-adjustment systems are used, which are generally referred to as actors. Also, the read / write head of a hard drive or the cars balancing on a stationary pendulum is known as an actuator. The control is generally done in an open or closed loop. A specific data transmission process named Fieldbus. You practically use hundreds of Actuator without your knowledge. Your body has God Made Actuator things, most if malfunction no one can repair! Other than your body, a basic dropper is a primitive Actuator. It is your brain which is programing how much force to be applied to deliver a certain amount of fluid. Actuator is used to deliver drugs – Inhalers have mechanical closed system Actuator. Your car if not a old carburetter fitted one, has Actuator to deliver gas in to the Engine – yes, this is they say as various patent named technologies as simply the variation and finer control of this Actuator system will increase fuel efficiency. This Article Has Been Shared 4540 Times! Cite this article as: Abhishek Ghosh, "Actuator : What is an Actuator and Where We Use Actuator," in The Customize Windows, May 13, 2012, April 24, 2019, https://thecustomizewindows.com/2012/05/actuator-what-is-an-actuator-and-where-we-use-actuator/.